Additional research provided by Cecelia Moore. See also: Opera Houses; Outdoor Dramas; Strolling Players; Thalian Association. Theater productions have been a vital part of the culture and entertainment of North Carolinians since colonial times. Much of the success of North Carolina's theater tradition can be attributed to innovative statewide service organizations. The Institute of Outdoor Drama, the North Carolina Arts Council, and the North Carolina Theater Conference support new and evolving groups, assist in organizational growth, act as a clearinghouse for information, and represent the theater community as a collective voice. The Arts Council, part of the Department of Cultural Resources, has been a state agency since 1967. The section that deals with theater operated separately as N.C. Theater Arts from 1972 until 1981. The North Carolina Theater Conference, founded in 1970, offers support and a conduit for communication to all levels of theater, both to theater companies and individual practitioners. At the local level, the state boasts more than 100 arts councils, including one of the country's oldest, the Arts Council of Winston-Salem/Forsyth County, founded in 1949. By the early 2000s there were at least 780 theater providers (organizations and individuals) in North Carolina, with at least one in almost every county. James H. Dormon Jr., Theater in the Ante-Bellum South (1967). Philip C. Kolin, ed., Shakespeare in the South: Essays on Performance (1983). Harry Gene Lominac, The Carolina Dramatic Association: Its History, 1922-1962 (1962). Hugh F. Rankin, The Theater in Colonial America (1965). Richard Walser, ed., North Carolina Drama (1956). Charles S. Watson, The History of Southern Drama (1997). 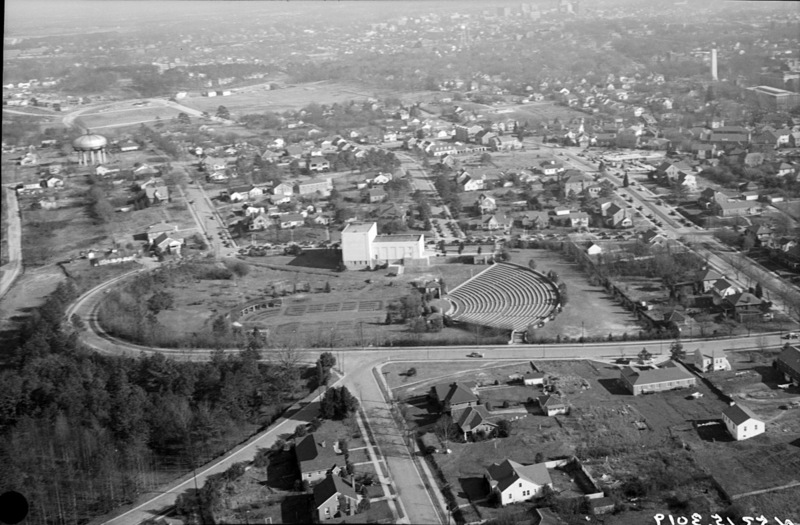 Aerial view, Raleigh Little Theatre and site of Rose Garden, Raleigh, NC, February 11, 1949. From the Albert Barden Collection, North Carolina State Archives, call #: N.53.15.3019. 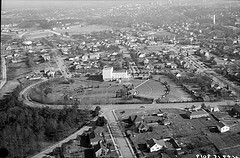 Available from http://www.flickr.com/photos/north-carolina-state-archives/2332971403/ (accessed October 1, 2012).